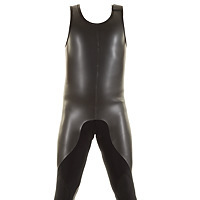 The classic Farmer John that surfers used back in the day; a one piece sleeveless suit that covers the legs and torso. 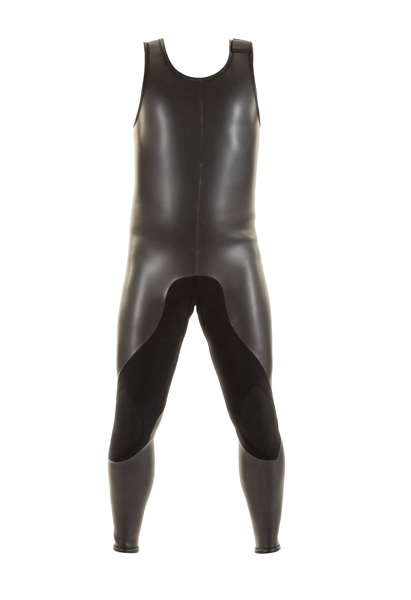 While shown here separately, the John can be worn under a long sleeve Smoothie Beavertail Jacket, which covers the arms and adds an additional layer of neoprene around the torso for maximum warmth. This Farmer John is available as a 3mm and has a Smoothie neoprene exterior that sheds water instead of absorbing it as a Nylon exterior would. The John has a Nylon interior, exterior knees, crotch and seat and the seams are glued & blindstitched with with zig-zag hemming for durability. The left shoulder fastens with a Hook & Loop closure for easy entry and exit. Also available with back zipper or deep scoop step in neck.